Brian Sykes’ miniature replicas of Manteo businesses are remarkably accurate. His keen eye for architectural details that others easily overlook is translated into tabletop replicas of local buildings. For over 10 years, Sykes, a Beach Club of Dare County day program participant, has been visiting local businesses, oftentimes only once, and creating a remarkably detailed miniature version. The Beach Club of Dare County day program, located in Manteo, serves those with intellectual and developmental disabilities through a variety of supports and programs including art. Sykes is a talented artist and his artwork can be seen displayed throughout the Beach Club location. His miniature versions of area businesses are showcased in the program’s entryway. “I picture it in my mind and recreate it,” Sykes, 38, said of his unique ability to see a building once and create a precise, smaller version using poster board, foam board, markers and tape as his tools. He has replicated many area businesses such as the OBX Bowling Center, McDonald’s, Wendy’s, Maola Dairy and Pizza Hut. Well-established businesses such as Manteo’s TL’s Diner and the Elizabethan Inn displayed Sykes’ artwork at their place of business. Appreciative of his artistic efforts, the staff at Big Al’s Diner presented Sykes with a hat and T-shirt. With his quiet demeanor, Sykes, a volunteer for Meals on Wheels, takes his artistic ability in stride. He particularly likes the color red so many of his creations feature the hue. Community Engagement Team Leader Colleen Zoubek and the staff at the Beach Club are in awe of his talent. Sykes looks forward to replicating a few more businesses including the local KFC and Taco Bell. “We are very proud of Brian and can’t wait to see what is in the works,” Zoubek added. 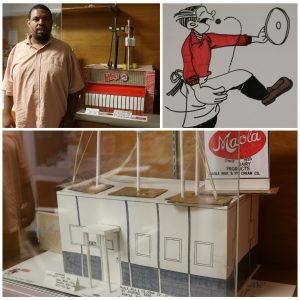 Photo collage: top left, Brian Sykes with his replica of Wendy’s in Manteo; top right, one of Sykes’ cartoon drawings; bottom, a smaller version of Manteo’s Maola Dairy.